Bayou Underground is my tribute to Louisiana, one of my favorite places to visit ever since I went there for the first time in the mid-1980s, and the home, source or inspiration behind some of my favorite books, movies and records. Half travelogue, half guidebook, Bayou Underground is probably best described as a cultural i-Pod, caught somewhere between a rock book and a hard place. But the rock is simply something to listen to while driving from place to place. Plus, it drowns out the sound of the bugs on the windscreen. 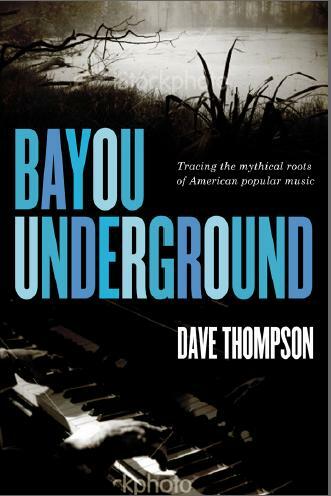 Bayou Underground was published in 2010 by ECW Press. LISTEN TO: My October 14 2010 interview with Mark Lynch of WICN radio. Join us tonight for a wild tour of the humid and funky Bayou region. Our tour guide will be DAVE THOMPSON, writer and rock historian. His new book BAYOU UNDERGROUND: TRACING THE MYTHICAL ROOTS OF AMERICAN POPULAR MUSIC is part cultural history, part musical history and part hallucinatory travelogue. Tonight Dave talks about the mythical swamps, Dr. John; young Elvis; Bo Diddley, Nick Cave, Dylan, Robert Palmer and photographer Ernest J. Bellocq. The Swamp Thing even raises its fetid head. This is a musical portrait of the Deep South unlike anything you’ve heard. A little under a century ago, on the southwestern bank of Lake Pontchartrain, there stood three tiny towns named Ruddock, Wagram and Frenier Beach – which wasn’t a beach in the slightest, although it would later boast a pier and a bathhouse, and a wooden pavilion where the locals made merry. We passed here on the way down, as River Road took us through Laplace and, for the moment, we thought nothing of it. So we double back to find that junction where Highway 55-North is spit out, turn east on a typically rutted asphalt road, bump across the tracks of the Illinois Central Railroad, and finally, we’re there, wherever there might be. Even when the place was booming, that asphalt was a boon yet to come. But it was a thriving community regardless, three towns spaced around four miles apart, and largely peopled by German immigrants who lived by lumber and farming. Throughout the first years of the 20th century, the Burton Lumber Company and the Ruddock Cypress Company, Ltd. were big business in these parts, with Burtons estimating that there was somewhere in the region of four million linear feet of cypress logs, just laying there for the taking. So they took them, and the communities around grew – if not rich, then at least reasonably comfortable on the proceeds. Ruddock was the biggest; headquarters, of course, of the Ruddock Cypress Co., the town was largely constructed on the lake itself, its one and two-story houses and offices rising on great stilts from the swamps. Further stilts supported the wooden sidewalks that ran the length of the village, so you could pass from the community center to the blacksmiths without even thinking of getting your shoes damp; from the Holy Cross Catholic Church to the railroad depot, and even out to the Owl Saloon, a men-only bar which discretion had parked about half a mile south. Frenier Beach and Wagram were smaller, but no less industrious. Here, the locals specialized in two complimentary trades, cabbage farming and barrel stave manufacturing – complimentary, because the harvested cabbages would then be packed into the locally-made barrels for shipment, via the railroads, to the north. By 1915, much of the property around Frenier Beach was owned by one woman, “Aunt” Julia Brown. A woman of color she may have been, but she was wealthy and wise. She was also a witch, or a Voodoo priestess, and few of her neighbors enjoyed passing by her home, particularly if she was out on the porch. Aunt Julia was a songwriter, you see, but the songs that she wrote and sang to herself were scarcely the stuff from which comfortable dreams were woven. “One day I’m gonna die,” she sang, “and I’m gonna take all of you with me.” Or sometimes “on the day I die, I’ll take Frenier with me.” Different tellings conjure different lyrics, and nobody seems to have bothered writing down the rest of the song. It doesn’t matter either way, because she was right. She did. The Great West Indies Storm hit the United States on September 29th, 1915. Modern equipment would allow us to know it was a category three, moving northwest from the Gulf of Mexico at around 14mph, with sustained winds near its center of 115mph. Down in New Orleans, the Times-Picayune newspaper had been warning of its approach for a couple of days now, although the only way you’d know that would be if somebody aboard one of the passing trains dropped a copy off – Frenier had no newspaper of its own; hell, it didn’t even have a grocer’s store, so unless you wanted to live on cabbage, and whatever you caught in the swamp, you’d have to rely on the railroads for that as well, handing your shopping list and cash to the engineer when the train passed through in the morning, and then collecting your provisions from him when it came back in the afternoon. So yeah, there was a storm coming, but to be honest, more people were worried about Aunt Julia’s song than paid any heed to a bit of wind. On the day I die, I’ll take Frenier with me. Well, now she was dead, breathing her last on the same day that the storm first hove into view, and today, she’d be buried, on a windy Wednesday at the end of the month. Windy and windier. The lake was storm tossed and the first trees were already being pulled up by their roots. Railroad maintenance teams were on stand-by in case any wires came crashing down… which is what they were now doing… or trees collapsed onto the track… which was also happening. The first reports were coming in of more serious danger. At Bayou Labranche, a tiny set up where the Illinois Central could refill their engine boilers, the station had just been washed away and its occupants had to swim for their lives. Wagram was underwater, the Rigolets railroad bridge was washed away, and the storm was bearing down on Frenier Beach. But Frenier Beach had a funeral to attend. Aunt Julia may have unnerved people, but they admired her as well, and the whole town seemed to be pouring out to pay their final respects. The funeral service would begin at four. But the storm wouldn’t wait. The wind was screaming now and the mourners who gathered around the old lady’s coffin were suddenly scattered as the windows of her house blew in, and the walls began to peel away. Then the winds snatched up the coffin and carried it into the bayou, along with everything else it could gather – livestock and the living included. Later, once the winds had died down and the waters were finally agreeing to recede, Aunt Julia’s body was found deep within the cypress swamp. But only her body. Her casket had disappeared, along with more or less everything she had owned… the personal possessions that she kept around her house, the house in which she lived… and most of the property she had collected around Frenier Beach. And the people who lived in it… the ones who were found, at least… were buried in a mass grave in Manchac Swamp. There was a graveyard in Wagram, located on a shell Indian midden, but it was too far to carry the dead through the storm-wracked carnage. So the survivors made rafts from driftwood, and the dead were floated across the lake to their final resting place. Frenier Beach itself had disappeared. It’s remains operated for a time as a lakeside resort, and a subsequent landowner built the pier and a pavilion, but further storms and natural erosion all took their toll on the business. Or so the realists said. The locals, however, had another opinion. They still blamed Aunt Julia. Yes it is on the property of cajun pride swamp tours outside of new orlands. You can see the mass grave on the swamp tour and some big gators as well.